Announcement Welcome to Sevhead 3d Designs, original art and jewelry designed by Don "Sev" Severance. Collectible, wearable, functional and decorative designs you won't find anywhere else . . . for people who enjoy a personal connection to their art and the artists who create it. It's important to me that your shopping experience at Sevhead 3d Designs is as pleasant and efficient as possible. I thank you for stopping by my shop and if you chose to purchase one of my pieces I would love to know how you feel about my work and the entire process. You can leave a review by going to You > Purchases and reviews. The option won't be available if the order is not eligible for reviewing. If the order is eligible for a review, select the star rating for the item, write your review, and then click Post Your Review. On the iOS app, tap You > Purchases & Reviews. On the Android app, tap Purchases. Find your order and tap Leave Review. The option won't be available if the order is not eligible for reviewing. If the order is eligible for a review, select the star rating for the item, write your review, and then tap Submit. If you leave a five-star review for your purchase, you will be given the option to include a photograph of your purchase. "I'd love to see some photos." Welcome to Sevhead 3d Designs, original art and jewelry designed by Don "Sev" Severance. Collectible, wearable, functional and decorative designs you won't find anywhere else . . . for people who enjoy a personal connection to their art and the artists who create it. Exotic Female Drummer "Cold Cast Resin" Statue "Blyss"
Exotic Female Drummer Bronze Statue "Blyss"
Love when art and function convene so tastefully. This looks great in my home and as delicate it may look, i hang anything from my pearl necklace, to my car keys, on it. Picture does not do it justice. Love this! Very unique and I always get compliments on this piece. Pendant is beautiful. Love the design. Bought this as a gift for a friend who has everything. She loved it! This Mermaid is beautiful! It is perfect for my bathroom. I hang hairbands and jewelry on it. Thank you to the artist who made it! 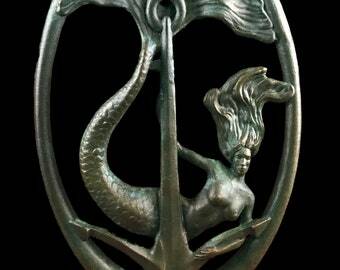 The latest addition to "The Mermaid collection"
Here's a new close-up photo of the Mermaid Door Knocker – one of the designs in "The Mermaid Collection" in my Etsy shop. Here's the new shop icon for "The Mermaid Collection" in my Etsy shop. I hope you check out my Mermaid designs. From The Mermaid Story Trilogy to The Mermaid Collection . . . 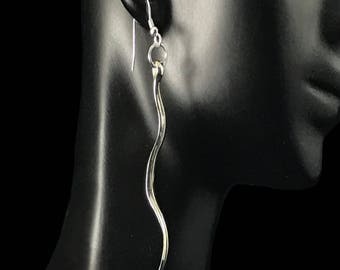 Designed exclusively for people who appreciate the personal connection to the artist and his/her work, “The Mermaid Collection” was conceived to offer an alternative to mass produced images of the stereotypical depiction of mermaids. My mermaids are not shy. They are sensuous beings living in a liquid world; essentially weightless, they swim, float or fly effortlessly through a world unknown to most humans. They are a playful, mystical community of sensual creatures and in my mind, perfectly designed for a planet that is over 70% water. 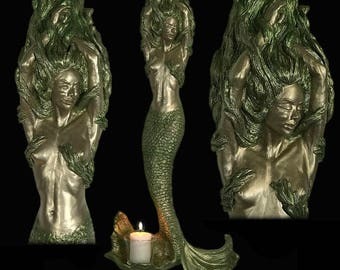 The Mermaid Collection is the direct result of my years figure sculpting, my interest in the sensuous nature and design possibilities of the iconic "Mermaid" image and the development of my books: The Mermaid Story Trilogy - now available on Amazon. I use Pixologic's Zbrush to create my detailed 3D designs. That 3d information is fed into my state-of-the-art Moonray 3d Printer. Some complex models take as many as 20 hours to print, then the rough prints are hand filed and sanded to remove the intricate support systems. When I'm satisfied with the result the finished model is sent to the bronze foundry where a mold is made then filled with wax. After it has cured the wax is removed and carefully inspected and refined until it represents an accurate duplicate of the original. From there it goes to the ceramic room. It is dipped repeatedly over the course of several days until it is fully encased in a hard ceramic shell. The wax is melted out and the molten bronze is poured in. 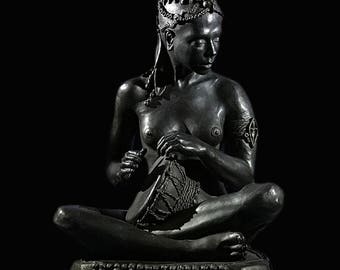 The final stage is a time consuming process of grinding and sandblasting the bronze and applying the appropriate patina. Then the piece is finally ready for the photo shoot. 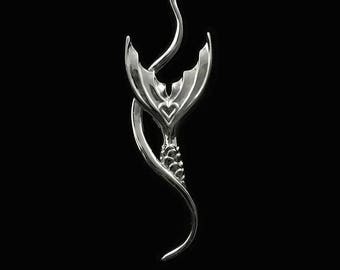 The designs for jewelry pieces are sent to the 3D printing facility Shapeways where they manifest the beautifully finished renderings in silver using a lost wax process similar to the bronze casting. Sevhead 3d Designs is the visual arts branch of Sevhead.com, a NH, USA based multimedia studio run by 3D artist, author and musician Don “Sev” Severance. This is a bronze casting facility that molds and casts my 3d printed prototypes. When I'm satisfied with my design I create a prototype with my 3d Printer which is further refined by hand. Then I send the finished model to R.I. Custom Casting where a mold is made, molten pewter is poured and the final piece is hand polished. Shapeways 3D Printing is a user friendly site for uploading 3D designs with a well thought out system for the production of high quality 3D prints in a variety of materials and a finishing process that results in shimmering detail. Welcome to The Mermaid Collection. If for some reason you are not satisfied with your purchase notify me. Generally I will accept returns, shipping at your expense, for a full refund minus my shipping cost for any items with free shipping. Flat rate shipping charges will be added to your balance.